Booking with The Ark Stanley constitutes acceptance of The Ark Stanley’s terms & conditions as detailed below. A comprehensive booking confirmation will be sent at the point of reservation, deposit or payment of the full amount. Payment in full will be taken for all bookings at the time of reservation, unless other arrangements are made and confirmed in writing by The Ark Stanley. Payment can be made by direct deposit into our nominated bank account, on site via cash, or through Visa debit, Visa credit or Mastercard. Where a Visa debit, Visa credit or Mastercard is supplied through our secure online booking button featured on our website, please ensure adequate funds are available as payment will be taken from the credit card when you submit booking details. Where a deposit is accepted for a booking, this deposit will total 50% of the total reservation and will be required to be paid at the time of reservation. Payment of the deposit can be made by direct deposit into our nominated bank account or, where other arrangements are made and confirmed in writing by The Ark Stanley, on site via cash, Visa debit, Visa credit or Mastercard, or through the supply of a valid and current Visa debit, Visa credit or Mastercard on the secure online booking button featured on our website. The balance of the reservation will be due and payable 14 days prior to the check-in date, unless other arrangements are made and confirmed in writing by The Ark Stanley. Payment of the balance can be made by direct deposit into our nominated bank account or through the supply of a valid and current Visa debit, Visa credit or Mastercard. Where the balance is paid using a Visa debit, Visa credit or Mastercard supplied through our secure online booking button featured on our website, please ensure adequate funds are available as payment will be taken from the credit card within the specified period. Where the balance is to be debited from the credit card supplied at the time of booking, this same credit card will be used unless you supply alternative details prior to this date. Where bookings have occurred through a third party’s website, a valid credit card must be supplied at time of check-in along with photo id. Payment in full is required for all vouchers at the time of reservation, unless other arrangements are made and confirmed in writing by The Ark Stanley. Payment can be made by direct deposit into our nominated bank account, on site via cash, or through Visa debit, Visa credit or Mastercard. Where a Visa debit, Visa credit or Mastercard is supplied through our secure online booking button featured on our website, please ensure adequate funds are available as payment will be taken from the credit card when you submit booking details. The Ark Stanley reserves the right to cancel your booking in the unlikely instance that it is deemed to be in your best interests. This would include extreme bushfire risk, an extended water or power outage or damage to your booked accommodation due to storms or other means. In this instance you will be given as much notice as feasibly possible and be provided assistance in securing alternative accommodation. 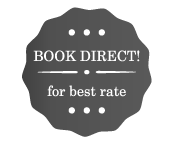 You will be refunded in full any deposits already paid and receive a 10% discount on your next booking at The Ark Stanley. Less than 14 days notice prior to date of arrival – Full cost of stay is payable. Over 14 days notice prior to date of arrival – Deposit forfeited. A booking cancelled by email cannot be considered a cancellation until we acknowledge by return email. Confirmation email, immediately after the reservation is made. If you do not receive this, the reservation has not been completed or it has been caught up in your JUNK folder. Reminder email, about 14 days prior to your arrival. This will remind you of your upcoming stay and ask you if you need us to assist in any way. Thank you email, sent out a few days after your checkout date. please contact us prior to making the reservation. Any breakfast or food products may contain food ingredients that are a potential food allergen for certain people. Some food items may contain traces of nuts. Please advise in advance of your check-in date if you have a food allergy. The Ark Stanley will endeavour to accommodate any special requests but is unable to absolutely guarantee any particular food is free of any trace ingredients (eg. such as nut traces). The Ark Stanley reserves the right to charge to your credit card with any undeclared mini bar charges or items that have been removed from the suite, or for cost of repairs if any damage occurs to a suite or items therein. Guests are responsible for missing items from the room and will be charged for full replacement value. Please note that if special additional cleaning is required to a suite (that is, due to staining carpet or the like) an additional charge may be applied of a minimum $50. Foul smells is considered damage. Please note that The Ark Stanley is non-smoking/non-vaping inside rooms for the comfort of all. Smoking/Vaping inside the suites or common areas indoors is not permitted and special additional cleaning charges apply of at least $100 if this occurs. Admiral: No more than 5 persons. Anderson: No more than 3 persons. Belvedere: No more than 3 persons. Corinthian: No more than 2 persons. Weatherly: No more than 2 persons. 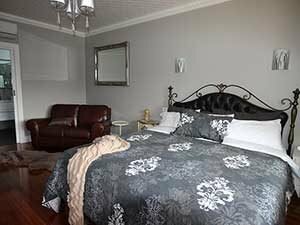 Please note that if more persons other than the original booking with the above allocations applied are found to be staying in a suite, The Ark Stanley reserves the right to apply an additional booking charge. Any guest under the age of 18 cannot occupy a room without a parent or guardian. Please note that The Ark Stanley expressly prohibits “parties” in suites, for the comfort of all guests. Guests are required to conduct themselves in a reasonable and responsible manner at all times when on the property of The Ark Stanley and must not act in any which may disturb other guests. Failure to adhere to this requirement may result in a guest being asked to leave The Ark Stanley in which event all sums due shall become immediately payable. The use of cookers/camping stoves/portable BBQ’s is not permitted inside the suites or common indoor areas for safety reasons. Also please note that pets may not be brought on to the property, for the safety & comfort of all guests. Any such use can attract special cleaning or damages charges. Please note The Ark Stanley accepts no liability for damages or losses to or of personal property. Internet usage: Your use of the wi-fi internet provided must not breach any applicable laws or regulations, and it is prohibited to use The Ark Stanley’s internet network for the purposes of illegally downloading or uploading copyright works, particularly through the use of file sharing applications or networks. You are solely responsible for your internet activity whilst using our network, and your internet access may be blocked if inappropriate activity is detected, including excessive bandwidth usage. Car parking facilities are provided for guests. The Ark Stanley accepts no liability for any loss or damage which may result from a guest’s use of the car parking facilities. All such use is at the guest’s own risk. The availability of parking spaces cannot be guaranteed and are available on a first-come-first-served basis. Welcome to The Ark Stanley website. The information contained within the pages of this website is for your general information only and is subject to change without notice. The Ark Stanley provides no warranty or guarantee as to the accuracy, performance, completeness or suitability of the information and materials offered o this website for any particular purpose. You acknowledge that such information and materials may contain inaccuracies or errors, with that information and material provided either directly by The Ark Stanley or third parties referred to on this website, and we expressly exclude liability for any such inaccuracies or errors to the fullest extent permitted by law. This website contains material which is owned by or licensed to us, which includes, but is not limited to, the design, layout, look, appearance and graphics. Reproduction is prohibited other than in accordance with the copyright notice, which forms part of these terms and conditions. This website includes downloadable PDFs and links to other websites. These downloads and links are available for your convenience to provide further information and they do not signify that we endorse the website(s). We have no responsibility for the content of the PDFs and/or linked website(s). The Ark Stanley may change this policy from time to time by updating this page. You should check this page from time to time to ensure that you are happy with any changes. This policy is effective from 1st July 2018. We receive this information to understand your needs and provide you with a better service, and in particular to respond to your questions and comments. In addition we may use the information to improve our products and services, to periodically send promotional emails about new special offers or other information which we think you may find interesting using the email address which you provided. We do not share your information with third parties for any purpose.